The Prologue: Setting the Stage and the Vision of the Christ Pantocrator (“King of the Cosmos”); Christ commissions John to record what he will be shown. The Seven Angels wreak havoc on humanity, but despite the catastrophic plagues, those who do not worship the Lamb refuse to repent. The Heavenly Host rejoices over the death of Babylon, for the blood of the martyrs has been avenged. The “Revelation to John,” or the “Book of Revelation” (please note the word is “singular” not “plural”) is one of the most difficult books to read in the entire Bible. Filled with images that are confusing, mysterious and frightening, many people have a hard time getting through its twenty-two chapters. And even then, most of us are left perplexed at the images and signs that are unique to this work of “apocalyptic” literature. Christians in every generation have scoured the text, certain they could interpret the symbols of the visions. Christians in every generation have declared that they have deciphered the hidden meaning and could predict when the end would come. They have all been wrong. And those who are today scouring the text, writing best-selling novels, using computers to look for hidden clues to the End are wrong, as well. Our purpose is different. We want to read Revelation as a devotional work, not to solve its mysteries but to find the lessons for our daily lives that God wants us to live by. Those lessons are there, written in plain sight, requiring no deciphering. And they are words of hope—hope for all Christians in all ages—words as meaningful to us today as they were to those who read John’s handwritten manuscript. These are the words: endure, be patient, overcome, be faithful, and come! 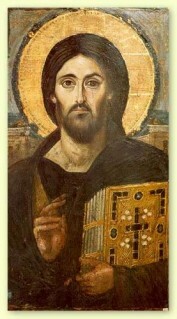 Christ Pantocrator. St. Catherine's Monastery, Sinai, Egypt. 6th Century, C.E. Image: InterCity Oz, Inc.